This is one of my all-time favorite headlamps. It’s lightweight, has a long battery life, AND is waterproof. I can be a bit clumsy, so the waterproof thing is actually a big deal for me. Not only does it feature a red LED light for night vision, but the white beam is fully dimmable and they both red as well as white have the strobe option. The BD Spot also has a battery indicator light, which is always nice for peace of mind. Have you ever dug out your headlamp only to find that somehow it had been pressed “On” at some earlier point in time and was dead when you needed it the most? Have no fear! The BD Spot has a “Lock” button so you’ll never have to find yourself in that situation again. The BD Spot is claimed to run for nearly 50 hours on the same 3 AAA batteries – but I don’t think this is accurate. I generally get around 42-43 hours of battery life before needing to switch out the batteries, yet this is still longer than the headlamps I have owned in the past. The Black Diamond Spot is a terrific option in an affordable bracket and delivers every time I use it! This sleeping bag is fantastic! I purchased it for my Europe trip back in 2013 and backpacked with it on several summer weekend trips prior to leaving. Even on warm nights I wasn’t hot, and although I would recommend using some sort of sleeping pad (I use a z-pad) it is by far the most comfortable sleeping bag I’ve ever owned. The lining is 100% Nylon, which always feels soft and fresh on my skin. The Mummy fit wasn’t a problem for me since I’m more on the slender side, and it fits easily up to 56 inches from shoulder to shoulder. The “Regular” is for women 5”6′ tall and below. Since I’m 5”8′ I purchased the “Long” and it leaves me with several inches to re-position and move about freely. I can even pleasantly sleep on my side with zero trouble. The hood feature has kept me not only warm, but dry in some cases, as well as securely hidden from any creepy crawlies (I’ve slept in some less than preferable places!). It seems that this specific model sleeping bag is currently out of stock, but don’t let that deter you. I’ve done some research and read several reviews and it seems the Phantom Spark 28 is quite comparable. Just as lightweight and compressible as the Phantom 32, the Phantom Spark (pictured below) boasts the same qualities; 800 Down fill, 100% Nylon, two-way zipper, Mummy fit complete with small pocket. Comes with compression bag and mesh storage bag as well. The only downside with this bag for me personally is it currently only comes in red, which is not necessarily my favorite color. 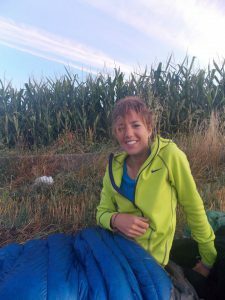 Feel free to check out a few sleeping bags and read their reviews! Shop Over 20 Degrees Sleeping Bags at MountainHardwear.com. This sleeping pad has held up for years. I’ve not had to replace it and have used it literally hundreds of times. Sure, it’s got some snagged parts from a rock or two, or perhaps from me taking a small tumble here or there down a mountain or three. But it’s amazing and I’ve been in love with it since day one. It’s extremely lightweight, and the accordion-style way it compacts makes it super easy to attach to my pack. Either using the bottom straps, or up top under my pack hood. 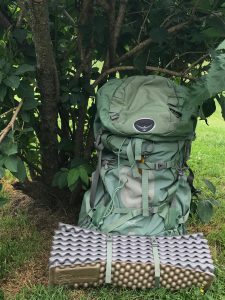 I’ve carried my Z-pad both ways and each are equally comfortable, although I did take note that using the bottom straps gives my pack a bit more sturdiness when setting on the ground during hiking breaks. When traveling through tropical climates too warm for a sleeping bag, travel sheets are a great alternative. I’ve bought a few sets but this sheet made made by Cocoon is by far my travel sheet of choice. It has worked wonderfully for me time and time again as a barrier between myself and hostel beds (giving me peace of mind where bed bugs may be a concern) or as a cover-up or pillow on lengthy buses and trains. Cocoon travel sheets are both lightweight and compact, making them an easy choice for me when aiming to pack light. Check out some of these other popular links while you’re at it! 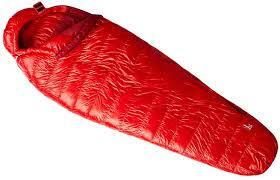 Hi Courtney, I agree the Therm a rest Z lite sol is the best sleeping pad hands down. Its light, won’t ever pop like an air pad, has way better R value and is cheaper than all the rest. They come in rolls or foldable. I noticed you got foldable which I found to be easier to tie and pack AND you can use it like a chair and sit on it anywhere! Yep! I use mine as a chair almost as often as I use it beneath my sleeping bag! Thanks for the compliment! There’s a TON of great gear out there, and everyone has their favorites for one reason or another. I’m just taking this opportunity to share mine! Happy it helped and good luck in your future adventures!